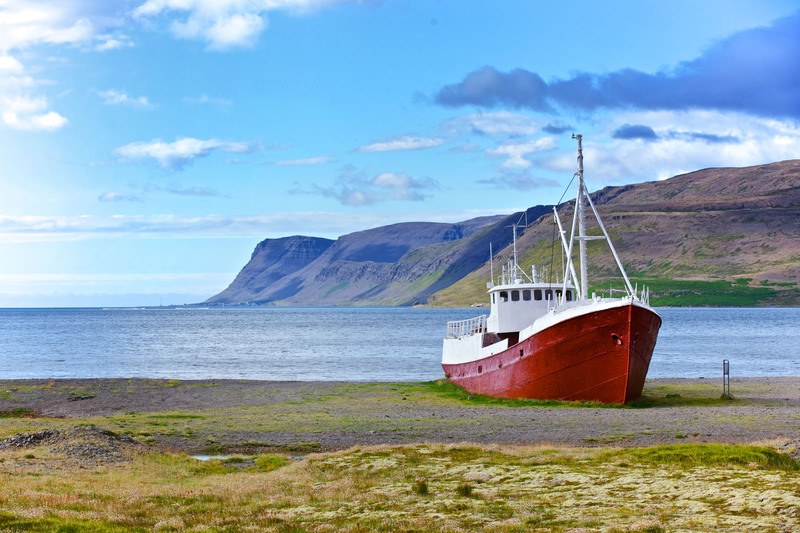 Adventure off of the beaten track in Iceland, and discover the wild and wonderful Westfjords. Truly a hidden gem, this region boasts breath-taking deep fjords, green valleys, hot springs and natural baths, eerie lava formations, waterfalls and out of this world tranquillity. On this unique 4-day private tour by luxury jeep, you will explore the Westfjords of Iceland and the Snæfellsnes Peninsula. You will learn all about the history and the geology of these two very special and peculiar regions as you discover their dramatic landscapes. Your expert guide and driver will be there every step of the way to answer questions and reveal secret spots so you can fully immerse yourself in the beauty and culture of the region You won't have to worry about navigating the rocky roads of the Westfjords, so you can just focus on taking in the gorgeous scenery. 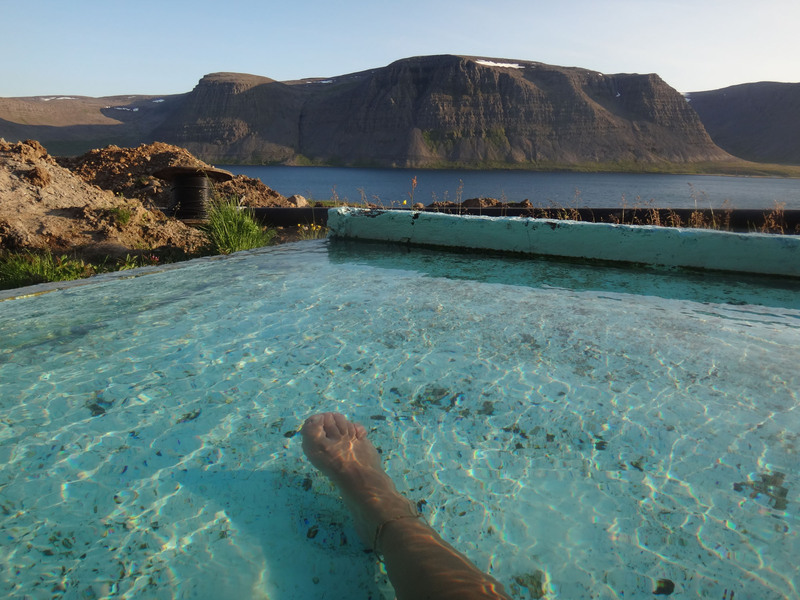 The Westfjords are the best place in Iceland to find some solitude. Enjoy the Midnight Sun in the company of birds, sheep, horses and arctic foxes, in places where time does not seem to matter and where you will get a chance to stop and appreciate the small things, relax and recharge your batteries. Pack up and get ready to explore the west of Iceland, including the most westerly point in all of Europe. Check availability by choosing a date. 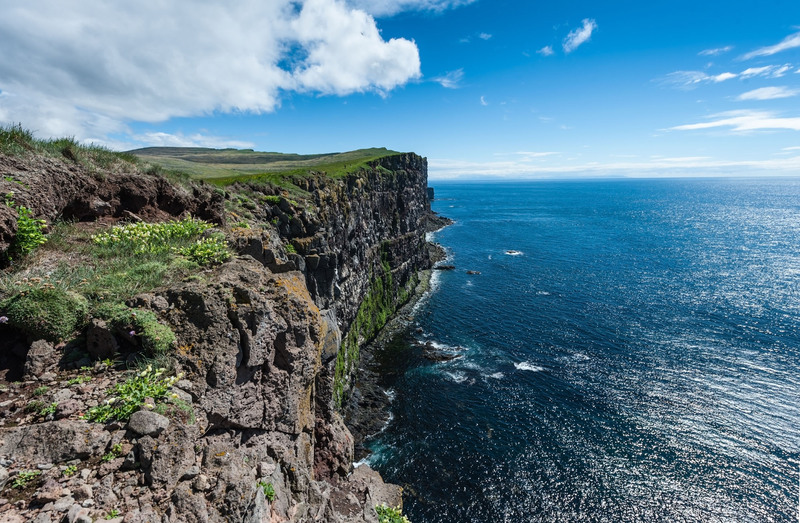 The Látrabjarg cliffs in the Westfjords mark both the westernmost point of Iceland and Europe. Hosting millions of birds, it is Europe’s largest bird cliff, 14 km (9 mi) long and 441 (1,444 ft) high. 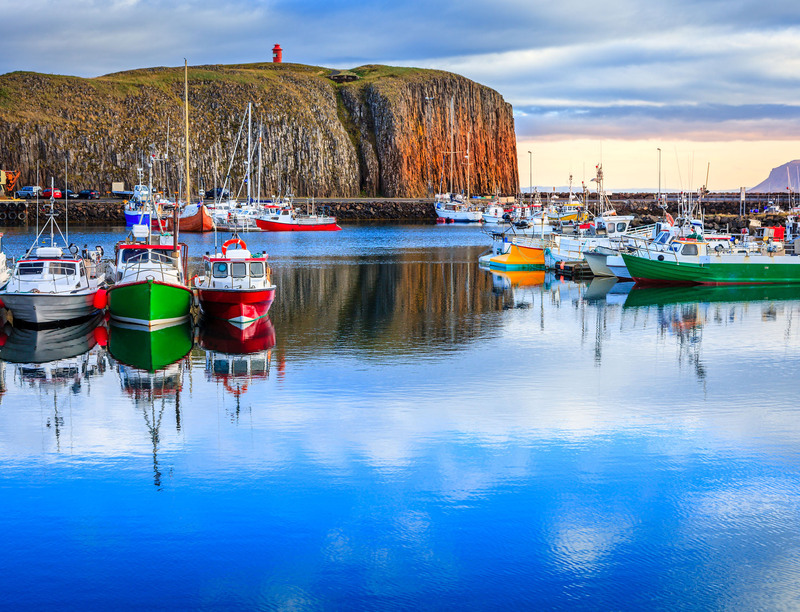 It takes around six hours to reach Látrabjarg from Reykjavík, so it is recommended that visitors travel there as part of a wider trip around the beautiful Westfjords. Látrabjarg is home to a wide variety of birds, in large parts thanks to the shelter and seclusion the cliffs provide as nesting grounds. It is not only the variation of species that makes Látrabjarg such an awe-inspiring place and undoubtedly one of the world’s best birdwatching locations; the sheer volume of individuals is staggering, with some estimating over five million nesting here in summer. The main species are Skuas, Arctic Terns, Guillemots, Eider Ducks and Razorbills. Of course, however, the stars of the show are the Atlantic Puffins. At least a million puffins nest here, often very near to the top of the cliff. As they are protected here, they have very little fear of people, and will let them within feet for some great photo opportunities. You should not, however, get too close to puffins for a variety of reasons. Firstly, they nest on sheer cliff faces, so a slip could send you falling. Secondly, puffins burrow rather than nest, making the surface of the cliff edge even more unstable; even if you caught yourself before tumbling, you could still crush an egg or a chick. Thirdly, puffins are socially aware animals, and if one flies off in a panic, it is common for all others to follow, spoiling the moment for everyone and putting chicks and eggs at risk. Be aware the puffins can only be found at Látrabjarg from May until late August. In 1947 Látrabjarg was the site of a famous act of heroism, in the form of a dramatic rescue. The British trawler Dhoon capsized, like so many other boats have, beneath Látrabjarg. Only twelve of its crew members survived the tumultuous, rocky ocean, pulling themselves up at the base of the cliffs. They would have no doubt died of hypothermia, if not for the fact that they were seen by local farmers. Though 190 metres (632 feet) above them, with time of the essence, the farmers knew exactly what to do. For generations, Icelanders had scaled down the cliffs of Látrabjarg on ropes to collect eggs and feathers, a practice that continues to this day. The farmers, therefore, put their harnesses on, scaled down, and pulled all twelve sailors to safety. Dynjandi (meaning ‘Thunderous’) is a series of waterfalls in the Westfjords and the largest of its kind in the region. Dynjandi is particularly beloved by visiting nature enthusiasts and aspiring photographers, who are able to snapshot this fantastic natural feature from a wealth of angles. Dynjandi can be found close by to Dynjandisvogur Bay and Arnarfjörður fjord, an area widely famed for its wealth of birdlife, stunning natural vistas and picturesque coastlines. Colloquially titled ‘the Jewel of the Westfjords’, Dynjandi (otherwise known as Fjallfoss) cascades approximately 100 metres (328 ft) in total, falling in a trapezoidal shape; it is 30 metres (98 feet) wide at the top, 60 metres (196 feet) wide at the bottom. In the summer, the flow rate of Dynjandi is up to eight cubic meters per second (282 cubic feet), whilst the winter it reduces to as little as one cubic metre per second (35 cubic feet). Those wishing to view Dynjandi from the top are able to hike nearly 200 metres (656 feet) up the cliffside. As they do, they will pass the seven individual waterfalls that lead to the largest: Hæstahjallafoss, Strompgljúfrafoss (Strompur), Göngumannafoss, Hrísvaðsfoss-Kvíslarfoss, Hundafoss and Bæjarfoss (Sjóarfoss). In 1996, there was a rocky path built to the top Dynjandi by volunteers, making the hike little more than 15 minutes in total. 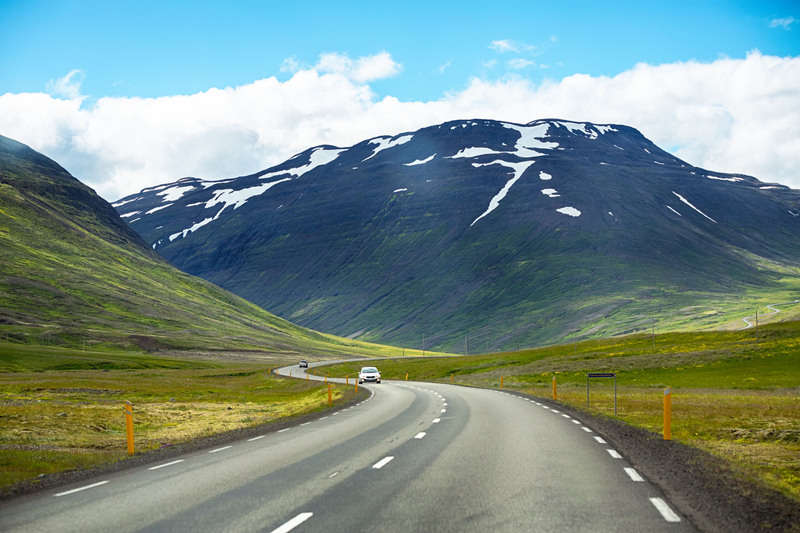 To travel to the Westfjords, one of your best options would be renting your own vehicle and driving yourself. Dynjandi is approximately 363 kilometres (226 miles) away from Iceland’s capital city, Reykjavík, meaning it will take some commitment to visit. 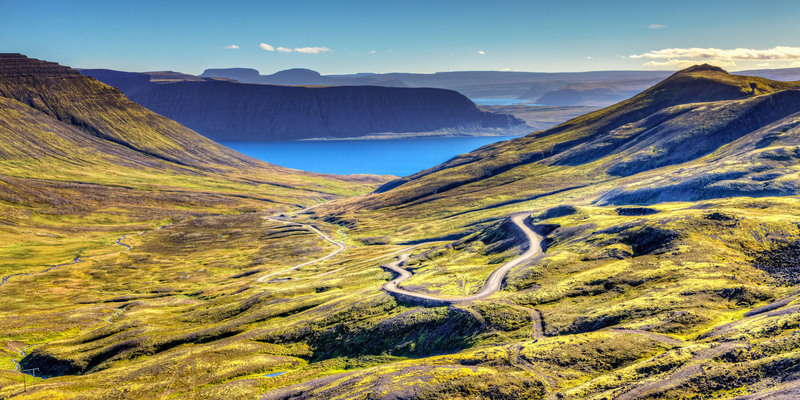 Alternatively, you could choose to join a guided tour around the Ring Road and the Westfjords, either by bus or Super Jeep, allowing an experienced tour guide to take responsibility for the driving. It is also possible to fly to an airport in the Westfjords from Reykjavík Domestic Airport. 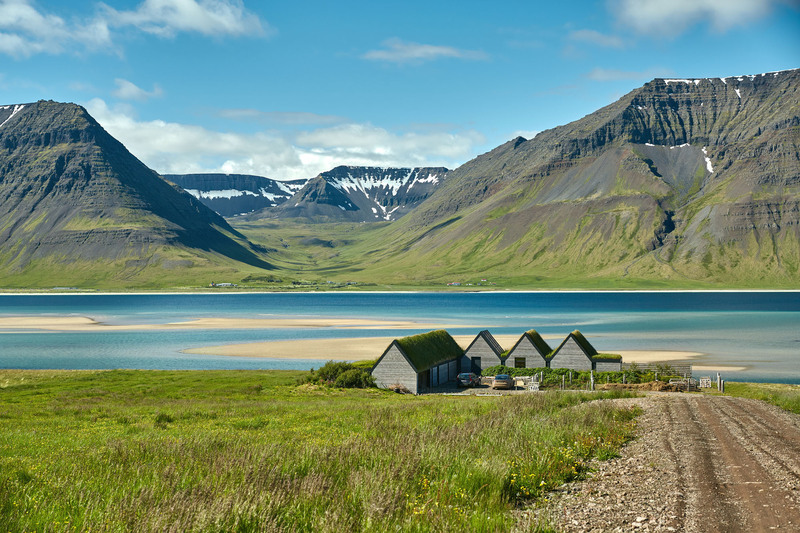 Though the Westfjords are remote, they have enormous appeal to nature lovers who want to avoid the crowds. Most visitors do not make the effort to travel to them, so the beautiful sites are some of the most unspoiled and peaceful in the country. Other than Dynjandi are sites such as the Hornstrandir Nature Reserve and the Látrabjarg birdwatching cliffs. 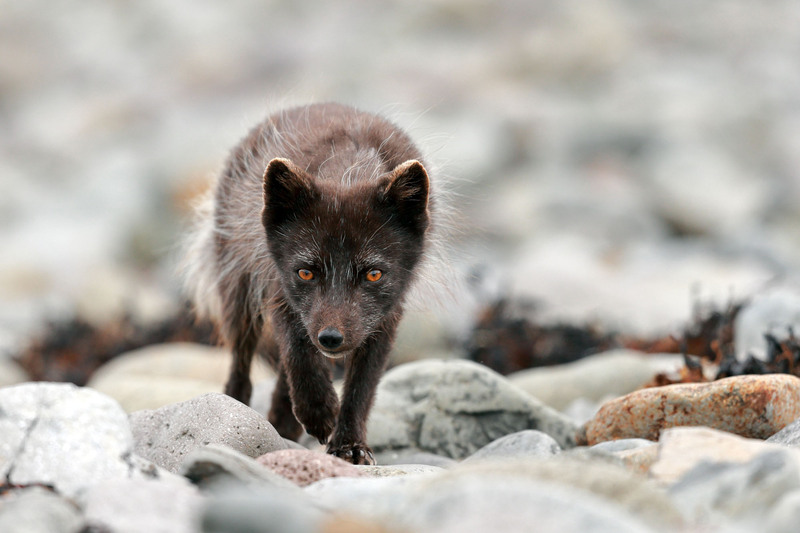 The former is the least populated part of the country, with incredible panoramas and a wealth of Arctic Foxes. The latter is the best place to see puffins from land, as they nest in the tens of thousands. Due to the fact that both species are protected in their respective habitats, they have little fear of people and will let you within mere metres. Though sparsely populated, there are a few significant towns in the Westfjords. Foremost amongst them is the settlement of Ísafjörður, which is the region’s capital and its centre of tourism and trade. Since 1981, Dynjandi has been considered a National Monument, meaning extra care must be taken not to stray from the specified walking trails. Iceland’s vegetation is incredibly fragile, often taking decades to repair once damaged. Remember, take nothing but photos, leave nothing but footprints. Ísafjörður is a town in the northwest of Iceland and the largest settlement of the Westfjords of Iceland. It is considered the capital of the region, and is the centre of trade, commerce, fishing and tourism. Ísafjörður is located on a spit within the fjord Skutulsfjörður, which is part of the larger fjord Ísafjarðardjúp. The settlement is one of the few large enough in the Icelandic Westfjords to be considered a town, with a population of around 2,600 people. According to Iceland’s Book of Settlement, the fjord Skutulsfjörður was first settled in the 9th century by a man called Helgi Magri Hrólfsson. Around the 16th century, Ísafjörður grew rapidly due to it becoming a merchant trading post. The town was granted municipal status in 1786. The oldest house still standing in Iceland, built in 1734, is located in Ísafjörður as part of the local folk museum. The area also includes the most extensive body of old timber frame houses in the country, constructed in the 18th century by foreign traders. One of these is Tjöruhús, now a seafood restaurant, and another Turnhús, now a maritime museum. Throughout its history, Ísafjörður has been one of the largest fisheries in Iceland. Several factors— a fishing restriction in the 1980s, drops in the fish population and monopolisation from bigger fisheries in Reykjavík—have led to a sizeable decline in the town’s population. In recent years, the tourism industry has yet again created local jobs and economic prosperity for the town. The town now has many hotels and hostels, restaurants and cafes, and tour operators offering trips out into the Westfjords. The climate of the Westfjords and Ísafjörður is tundra, bordering closely on subarctic, meaning the winters are cold and the summers cool. Due to Ísafjörður being located in a fjord surrounded by steep mountains, during the peak of the winter solstice, the rays of the sun don’t reach the town for weeks on end. The Westfjords have a wealth of birdlife, and Ísafjörður is no exception; many species can be seen on several hikes out of the town. When on such trails, keep an eye on the landscapes to spot Arctic Foxes, on the coast to see seals, or the ocean to spot a whale. 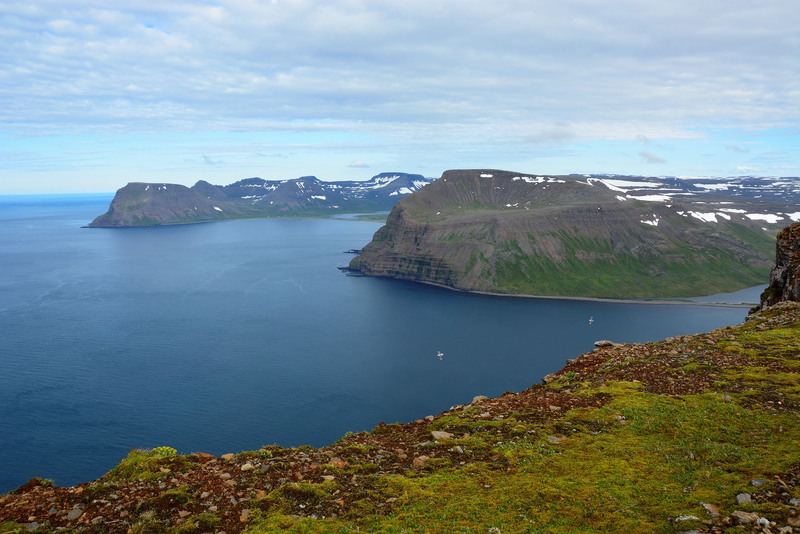 Ísafjörður is the most convenient place in the Westfjords from where to visit the region’s incredible natural sites. These include Látrabjarg, birdwatching cliffs perfect for getting up close and personal with puffins; Dynjandi, a series of waterfalls that look to be plucked from fantasy; Hornstrandir, a Nature Reserve with spectacular views; Rauðasandur, a red- and gold-sand beach; and Drangajökull, the only glacier in the country that is expanding rather than shrinking. Ísafjörður, despite its isolation and small population, boasts a proportionately urban atmosphere. The town hosts a multitude of events and festivals attended by people from all over Iceland, such as the Ski Week Festival, the Act Alone theatre festival, the European Championship of Swamp Soccer and alternative music festival Aldrei fór ég suður. Stykkisholmur is a town of about 1,100 people on northern shore of the Snæfellsnes Peninsula. It is a centre of service and commerce in the area, and the ferry Baldur sails from here to Brjanslaekur in the Westfjords. Stykkisholmur has long attracted settlers due to its natural harbour and its access to the fertile fishing grounds of Breiðafjörður. Because of its early settlement, it features in the Sagas (if not by name), notably Laxdæla Saga, one of the great early works of Icelandic literature. It is one of the earliest European stories with a passionate and powerful female lead Guðrún Ósvífrsdóttir, who struggles against a destiny to lose four husbands while trying to keep her children close and safe. According to the tale, she eventually became the country’s first nun, and when she died, was buried at Helgafell, a small mountain near Stykkisholmur. The first proper development for the town, however, came in 1550, with the creation of a trading post. Trading posts were uncommon in Iceland at the time due to the dangers and distances involved with travelling across the Atlantic, but Stykkisholmur’s natural harbour made it possible. The settlement grew further with the beginning of the Danish Trade Monopoly over Iceland, starting in 1602 and not ending until near the end of the 18th Century. Though the policies of this monopoly disenfranchised and impoverished many Icelanders, it did help the development of towns along the peninsula such as Stykkisholmur. In spite of the animosity felt from Icelanders towards the Danish under their colonial rule (a wound that has all but healed in every arena apart from perhaps sports), Stykkisholmur has always boasted good ties with their former rulers. Every years since 1994, on the third weekend of August, Stykkisholmur holds a ‘Danish Day’, where it celebrates the historic and continued relations between the town and country. It is also the sister town of Kolding in Denmark. Stykkisholmur is a cultural hub, particularly considering its size. There is museum called the Norwegian House, which is the oldest two-storey building in Iceland, from 1828, and reveals what life was like for wealthy Icelanders of the day. There is also a Volcano Museum and the country’s oldest weather station, dating back to 1845. Scenes to represent Greenland in the film ‘The Secret Life of Walter Mitty’ were shot in Stykkisholmur. In the novel Red Storm Rising, the town was the landing point of American troops liberating Iceland from the clutches of the Soviets. Stykkisholmur is on the northern side of the Snæfellsnes Peninsula, and thus close to many incredible natural sites. The two most significant are Mount Kirkjufell and Snæfellsjökull National Park. Kirkjufell is often nicknamed Iceland’s most photographed mountain; it rises from the edge of the ocean like a pyramid, and can be admired from many angles. Particularly pleasant is viewing it from beside the waterfall Kirkjufellsfoss, which trickles nearby. 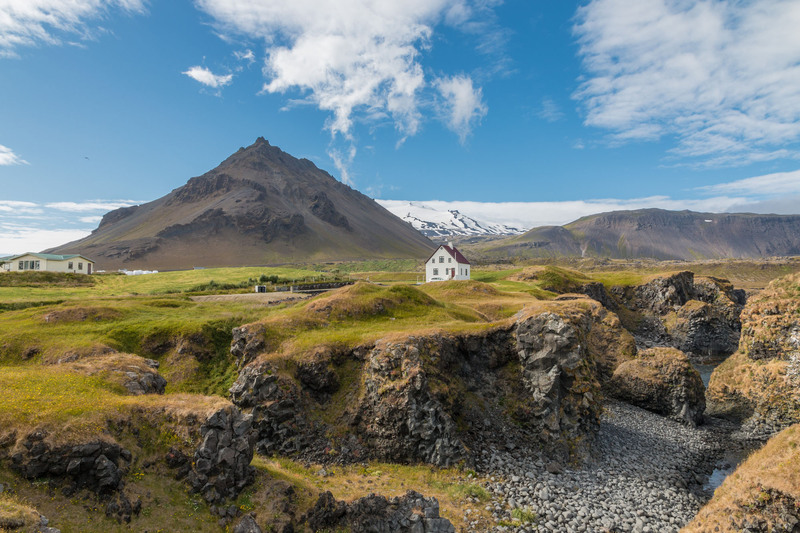 Snæfellsjökull is one of Iceland’s three National Parks, named after its crowning glacier and volcano. This magnificent, twin-peaked feature has featured in novels such as Jules Verne’s ‘A Journey to the Centre of the Earth’, and Halldor Laxness’ ‘Under the Glacier’. It is also steeped in folklore and mystery, said to home the spirit of the peninsula’s guardian spirit and a centre of strange energies. This was so much the case that thousands of people, including new crews from the United States, showed up one evening that some theorists predicted an alien craft landing on it. On the southern side of the Snæfellsnes Peninsula are many more attractions such as the Lóndrangar basalt cliffs, Ytri Tunga seal watching beach, and the Rauðfeldsgjá gorge. Borgarnes is a town of fewer than 2000 people, located on a peninsula at the shore of Borgarfjörður. It is a historical settlement, a cultural hub and an essential commerce centre for a large part of western Iceland. Borgarnes is located to the north of Reykjavík, reached by travelling Route 1, otherwise known as the Ring Road which encircles the country. This journey takes you through a six-kilometre tunnel beneath the fjord of Hvalfjörður, and over the second longest bridge in Iceland. If you would prefer to take the scenic route instead of the tunnel, you can make a turn on Route 47 to enjoy the beautiful Hvalfjörður fjord. This route is encouraged if you plan on hiking to the second tallest waterfall in Iceland, Glymur, which is nestled in the fjord. Please note that taking the long route will double the time of the otherwise hour long trip. If driving to the Westfjords, the Snaefellsnes Peninsula, or the north, Borgarnes serves as a great place to stop for fuel, food, drinks and a place to explore. Borgarnes was settled in Iceland’s earliest days, over a millennium ago, and has long been occupied by fishermen; the village was not to substantially grow, however, until the 20th Century when Iceland’s infrastructure boomed, and it became an essential gateway to the country’s north and the Snaefellsnes Peninsula. The town is now home to two museums, the Settlement Centre and, curiously, the Centre for Puppet Arts. The Settlement Centre is the largest and most famous. It houses two exhibitions, one on the Settlement Era and another on the Saga of Egil. The former talks about how Iceland’s settlement began in the late 9th Century, as Norwegian jarls began to unite under a king, and chiefs sought a new land where they could maintain control. En route, they took slaves, mainly women from Ireland, and the Icelandic population was formed. They settled across the country in approximately thirty clans, before uniting in 930 to form what would later become the world’s longest running representative parliament, thus beginning the Commonwealth Era. The exhibition is interactive and great for children and adults alike. Icelandic history is often overlooked by visitors in lieu of Iceland's incredible nature, yet is a surprisingly well-recorded story of hardship, unity, folklore and endurance against all the odds. The exhibition on Egil’s Saga is fascinating even to those unfamiliar with Icelandic texts. Icelanders have always been storytellers, and their greatest heroes are often poets and writers rather than kings and warriors. The sagas are amongst the first records of these stories and are still read in school today, much like Shakespeare in England. Interestingly, however, Icelandic is one of the world’s oldest languages, and the texts read similarly to modern-day works of writing. The saga perfectly captures what life in Norway and Iceland were like from 850 to 1000 AD, over several generations, and like many Icelandic pieces of writing, shows the many contradictions of the Icelandic character, spirit and family in a way that is both stark and sympathetic. If travelling with children, the Bjössaróló environmental playground is a great place to spend an hour or two. It was built by Björn Hjörtur Guðmundsson who spent years developing the park using salvaged materials for all the equipment. Here you'll find slides built into the surrounding hillocks, many swings, a jungle gym, spinning top and several lookout points. There's also a castle, an old boat, seesaws and a climbing dome. It's renowned as the best playground in the country, and additionally provides an excellent view of the sea. Rauðasandur is a beach in the Westfjords, famous for having red and golden rather than black sands like most other beaches in Iceland. Rauðasandur beach is located besides Látrabjarg, Europe's highest birdwatching cliffs. These cliffs are home to millions of seabirds, with razorbills, guillemots, gulls, fulmar, and hundreds of thousands of puffins (between May and September). Many of these birds can be seen from the beach as they make their way to and from the ocean. The beach, like all in the Westfjords, also boasts great seal-watching opportunities. Grey and Harbour Seals can often be seen bobbing in the water, or hauling out on the sands. Though not at all guaranteed, the Westfjords boast the best whale-watching from the land in the country. Though most of these animals are found in the fjords themselves, the lucky may spot some from Rauðasandur. The reason why Rauðasandur has its unusual colouration is because the Westfjords are no longer volcanically active, meaning there is no constant creation of the ashy sands that are found on other beaches such as Reynisfjara in the South. In summer, it even looks somewhat tropical. The remnants of a farm named Sjöundá can be found on Rauðasandur. At the beginning of the 19th century, this was the site of one of Iceland’s most famous murder cases. Two farmers and their wives lived there but one farmer, Bjarni, and the other's wife, Steinunn, had an affair. They were sentenced to death, accused of having murdered their spouses. Bjarni was executed abroad but Steinunn died in prison in Reykjavík and was buried at Skólavörðuholt. In the 20th century, she was moved to consecrated grounds and is buried in Hólavallagarður in Reykjavík. Steinunn's decendants, believing her innocent, recently gave her a tombstone. Icelandic novelist Gunnar Gunnarsson based his masterpiece Svartfugl (The Black Bird) on the Sjöundá murder mystery. In the desolate, dramatic, and awe-inspiring Strandir region of the Westfjords, the village of Hólmavík is the largest settlement. About 375 people (as of 2011) live here, and it serves as a centre of commerce for the area. In spite of its small population, Hólmavík has a fascinating history; it is notorious in Iceland for its link to witchcraft and witch-hunts, and as such, it is home to the Museum of Icelandic Sorcery and Witchcraft. Magic in Icelandic history folklore is a constant and fascinating theme, so for those interested in legend or a darker side of history, the museum is a must-see. Here, you can study the runes Icelanders would carve to curse their enemies or bless their friends. There is also a fascinating, if very macabre, set of sorcerer’s trousers on display, which are many of a man’s flayed lower half. They are called the necropants. Necropants were taken from corpses who, prior to death, consented for them to be used. Visitors with an appreciation for the past might also want to check out the village’s oldest house, built in the 19th Century and now home to the excellent coffeehouse/bar, Café Riis. Art buffs may appreciate that several well-known Icelandic artists were born in the area, such as poet Stefán frá Hvítadal and musician/composer Gunnar Þórðarson. Fisheries and tourism services are the mainstay of the economy of Hólmavík, as well as farming in the countryside surrounding the village. 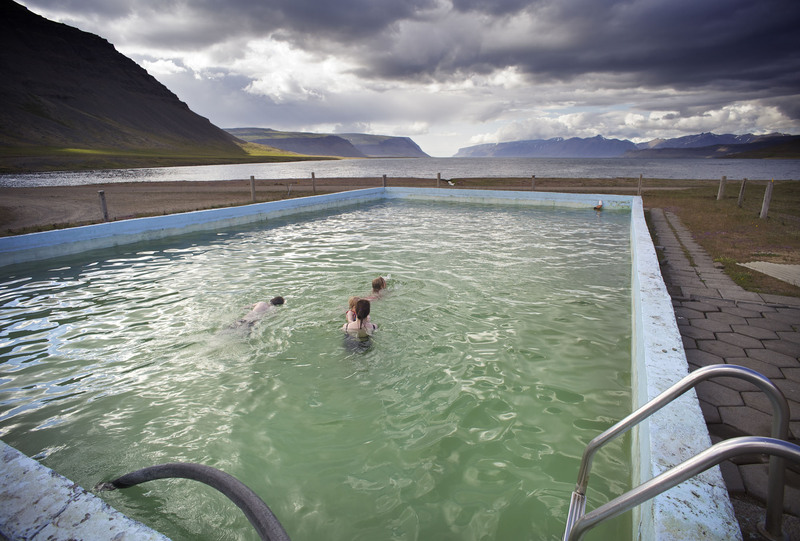 Those with interest in the latter can travel about 12 km from Hólmavík to the region’s Sheep Farming Museum. Here, visitors can learn about the history of Icelandic sheep farming and enjoy a nice cup of coffee, local bread and cakes at the caféteria. The surrounding area is also ideal for hiking. The peaks of Kálfanesborgir, in particular, give an impressive view of the region. Whale watching tours are conducted from here in summer. Whale watching from the Westfjords provide a great chance to see creatures such as humpbacks, white beaked dolphins, and over twenty other species. Kirkjufell, or 'Church Mountain', is a distinctly shaped peak found on the north shore of Iceland’s Snæfellsnes Peninsula, only a short distance away from the town of Grundarfjörður. It is often called ‘the most photographed mountain in Iceland’, due to its dramatic formation and perfect coastal location. Kirkjufell takes its name from its resemblance to a church steeple, sharpened at the top with long curved sides. From other angles, the mountain has been compared to a witch’s hat or even a freshly scooped ice cream. Peaking at 463 metres, 1519 feet, Kirkjufell is an impressive landmark. Throughout the centuries, Kirkjufell’s striking slopes have acted as a visual landmark for seafarers and travellers. More recently, it has attracted amateur and professional photographers alike. Within walking distance from Kirkjufell is the serene and perfectly located waterfall Kirkjufellsfoss, or 'Church Mountain Falls', an excellent subject for photographers who can easily frame the mountain in the background. Despite its relatively diminutive height, Kirkjufellsfoss’ three-steps, gentle flow, and dramatic differences between seasons make it as impressive as some of Iceland’s larger waterfalls. At the base of the mountain, visitors will also be able to find a lake; on calm and clear days, this lake reflects a perfect mirror image of Kirkjufell, only adding to the fantastic photo opportunities around this area. On top of that, the colours of Kirkjufell change with the passing seasons; the summer sees it a lush green, full of life, whilst the winter months scar the mountain’s face with a mask of barren brown and white. Of course, it is more impressive under the midnight sun in the weeks surrounding the June equinox, and under the northern lights, best seen between September and April. Fans of the HBO series Game of Thrones will recognise Kirkjufell as a shooting location from Season 7 of Game of Thrones. The mountain is showcased from the scenes ‘North beyond the Wall’ when Jon Snow, The Hound and Jorah Mormont, amongst others, brave the wilderness in hopes of catching an undead wight. Having seen it in a vision, The Hound acknowledges Kirkjufell as “[...] the mountain like an arrowhead”, and the events that happen beneath it are some of the show’s most dramatic. There is a fairly steep trail to the top of Kirkjufell, from where there are magnificent panoramas of the surrounding fields, coastlines and rivers. The mountain takes roughly an hour and a half to ascend, with another one and a half hours needed to get back to the bottom. Given the steep elevation and treacherous trail, you should only hike Kirkjufell if you are a very experienced and confident mountain climber, preferably in the company of an expert guide. Sadly, there have been three fatal accidents on the mountain, most recently in 2018. Kirkjufell is extremely close to Grundarfjörður, a small town on the Snæfellsnes Peninsula, which is just over two hours drive from Iceland's capital city, Reykjavík. From Grundarfjörður, one travels a few minutes west down Route Snaefellsnesvegur 54 to the base of Kirkjufell. Visitors have plenty of parking space to choose from, all free of charge. Búðir is a small hamlet in the municipality of Snæfellsbær on the westernmost tip of the Snæfellsnes Peninsula. The hamlet is located in the lava fields of Búðahraun in the region of Staðarsveit in west Iceland. Búðir consists of a church and a country hotel but is otherwise uninhabited. Búðir was once a prosperous fishing village and one of Snæfellsnes' most active trading posts. Medieval sources describe Búðir as one of Iceland's major ports and archaeological evidence suggests portal activity dating back to the earliest settlement of Iceland. In the beginning of the 19th Century, the trading post was abandoned but today, the area prospers economically because of tourism. Búðir boasts the vast lava field Búðahraun that reaches east from the hamlet towards the sea by Faxaflói Bay, and west to the reef of Hraunlandarif. The lava's source can be traced to the 88-metre tall volcanic crater Búðaklettur which is located in the middle of the lava field. The crater has an opening on its south-west side, where one can enter the 382-metre long Búðahellir Cave. Búðahraun is acclaimed for its rich flora, boasting approximately 130 different plant species. These include rare and protected species. The eastern part of the lava field has been an official nature reserve since 1977. Búðir also consists of a field of tall, windswept grass, and a beach of fair-coloured sand dotted with jet black lava rocks. Hótel Búðir is a charming country hotel where visitors can enjoy the reclusiveness of the surrounding area. All that remains of Búðir’s former community is the black wooden church Búðakirkja. A man named Bent Lauridtsen got a bishop’s permit in 1701 to build a church in the area. When it came to deciding the location, an old woman reportedly suggested making a man spin in circles until he became dazed and then have him shoot three arrows into the air. Where the third arrow landed, the church should be built. A small turf chapel was built two years later, where it stood until it was dismissed by orders of the Danish King Christian VIII in 1819. 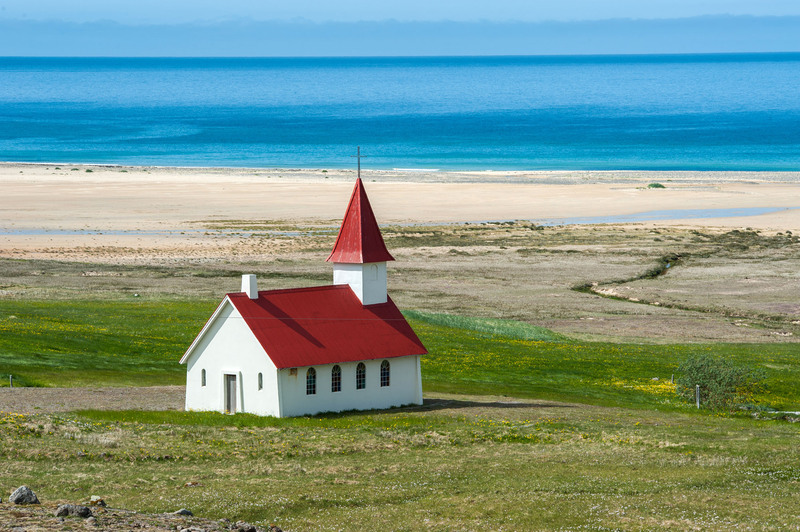 Several residents fought for the reclamation of the church until in 1849 the priest’s council allowed for the construction of a new house of worship—as long as the residents of Búðir would fully finance the project and see to its maintenance. A woman named Steinunn had meticulously cared for the artefacts from the old chapel, which resulted in the church still donning some of its original items, such a door latch engraved by Bent in 1703. Renovations were made in 1951, and again in the 1980s when it got slightly relocated and reconstructed according to its original Danish design. Glanni is a beautiful waterfall in West Iceland, located close to the Grabrokarhraun lava field and the village Bifrost. Situated nearby, in the middle of the lava field, is a mesmerising oasis. Glanni waterfall is small but drops in three multi-layered tires. The word 'Glanni' means brightness, or that which shines, and the waterfall is named after the bright colour of its water. The river that feeds Glanni, Norðurá, is amongst Iceland’s most popular fishing rivers. It is teaming with fish and salmon are commonly spotted jumping in the waterfall, up the man-made steps that have been constructed to ease their journey. Located in the Westfjords of Iceland, Patreksfjörður is a charming village of approximately 650 inhabitants. Its name means ‘the fjord of St Patrick’, named as such as it was settled by a reverend after Iceland’s conversion to Christianity. Patreksfjörður has grown into a great destination for tourism as the industry has developed in Iceland. Even so, its main industry, as it always has been, remains to be its fisheries. The town has several options for accommodation, with hotels, guesthouses, bungalows and a campsite. It also has restaurants, cafes, and a swimming pool, making it a perfect place to stay for those exploring the Westfjords. Bíldudalur is the nearest airport for those who do not have the time or license to drive to Patreksfjörður. There is one flight a day here from Reykjavík, and regular buses between the two towns. This settlement, in the southern part of the region, is close to many major attractions. Those in the nearest vicinity include Dynjandi, Látrabjarg, and Rauðasandur. Dynjandi, meaning ‘Thunderous’, is without a doubt one of the country’s – if not the world’s – more spectacular waterfalls. Falling from a height of 100 metres (328 feet), it tumbles in many steps, giving it an ethereal, otherworldly ambience. The path leading up to Dynjandi has many other waterfalls to be admired. Látrabjarg is the name of a set of cliffs, and is one of the world’s best spots for bird watching. Along this stretch, millions of birds can be seen, including, from May to September, the adorable and elusive puffin. 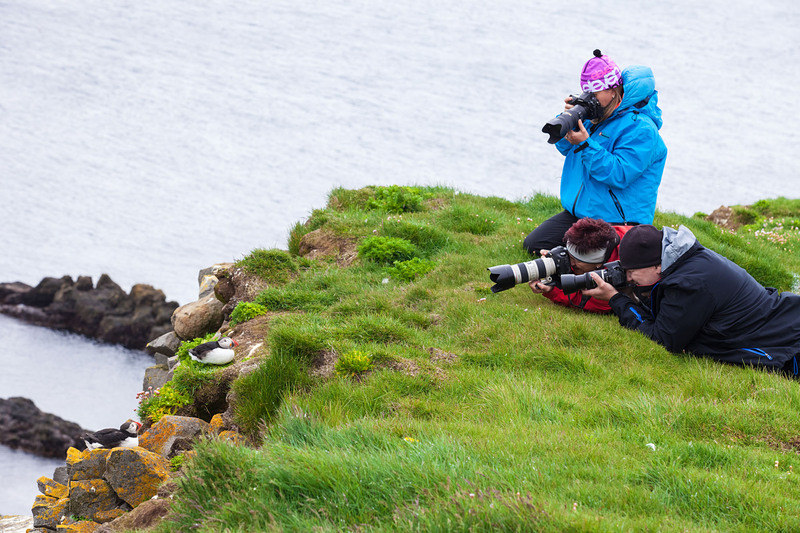 The puffins here are protected, and will let you get remarkably close for some excellent photographic opportunities. Rauðasandur, meanwhile, is a beautiful beach. Unlike most in Iceland, defined by volcanic black sands, the sand here is golden, red and orange, lending the area a somewhat tropical beauty. Surrounded by layered, flat top mountains, Bíldudalur is an attractive fishing village settled on the fjord, Arnarfjörður. This fjord-side location is responsible for the village’s envious reputation as “the good weather capital” of the Westfjords, and is a well tread spot for hikers, skiers and deep sea anglers. Despite it’s diminutive population size today (around 200 inhabitants), the development of Bíldudalur was once prospering, making it an important commercial hub for the Westfjords region. Following the cessation of the Danish Trade Monopoly in 1786, Ólafur Thorlacius made his reputation as one of Iceland’s most respected businessmen in the town, buying and selling merchandise, drying fish and running his own fishing fleet. At the beginning of the 19th century, Thorlacius had successfully turned the village into a base for his large commercial operation, a reality that continued with his successor, Pétur J. Thorsteinnsson, lasting until 1924. As with many coastal villages in Iceland, the fishing quotas of the 20th Century began to hurt Bíldudalur’s primary industry and put a stop to any further large-scale urban development. The economy, however, managed to successfully diversify. Thankfully, Arnarfjörður is positively teeming with Lithothamnion Tophiforme, red algae which, when processed, becomes seaweed-derived Hafkalk, a natural supplement. Today, the village’s primary industries are shrimp farming, tourism and Hafkalk mineral processing. Culture and music have thrived for years in Bíldudalur. In the past, the folk music festival, Baunagrasið, has seen musicians from across Iceland join for evening performances, workshops and courses. There is also an exhibition, “Melodies of the Past”, found in the basement of Jón Kr. Ólafsson, former vocalist for the 1960s Icelandic band, Facon. Inside, there is a wide array of LPs, instruments, posters and other fascinating objects from Icelandic music memorabilia. There is also the Icelandic Sea Monster Museum, where guests can enjoy electronic displays delving into the myth and folklore of these fantastical creatures. It might seem a little superstitious, but there are over 200 stories of locals coming across strange creatures slithering from Arnarfjörður. There is a large gallery of cryptozoological illustrations on display which might bring closer insight into these alleged run-ins. Around 45 minutes northerly drive from Bíldudalur is an epic series of waterfalls called Dynjandi, otherwise referred to as Fjallfoss. The waterfalls, collectively, have a height of over 100m. 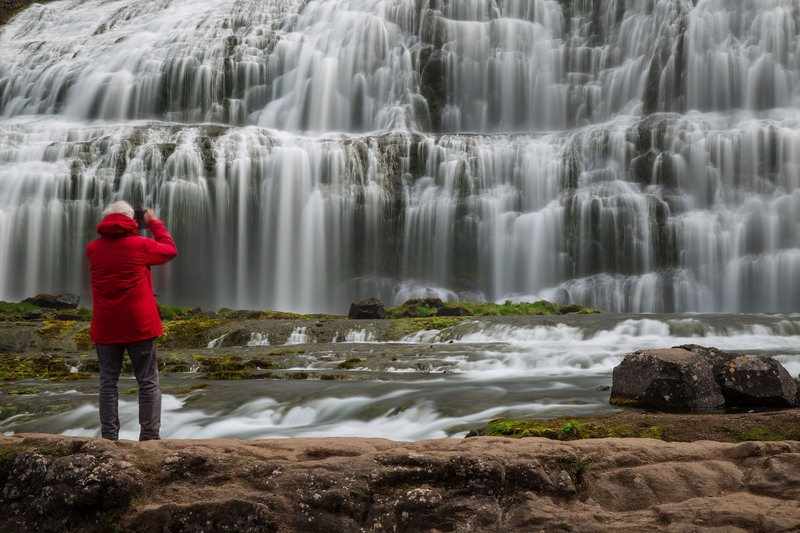 This area is particularly scenic for amateur photographers, who can snapshot the waterfall cascading from over the lip of the mountains all the way down to Arnarfjörður below. 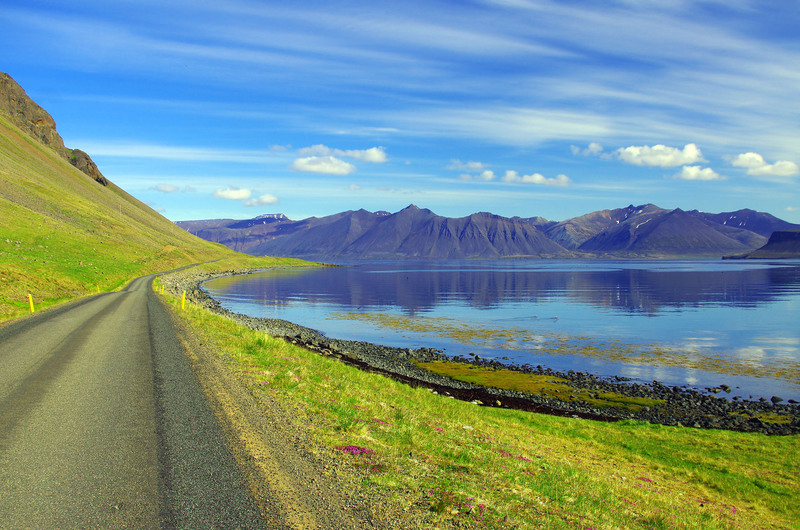 Today you will make your way to the Westfjords driving through west Iceland. After a short convenience stop in Borgarnes, a village surrounded by majestic mountains, located about an hour’s drive from Reykjavík, you will drive to Glanni, a beautiful waterfall, hidden in a lush birch wood surrounded by moss-covered lava in Borgarfjörður. After a short walk to the waterfall, it is highly recommended that you take the easy hike to Grábrók volcanic crater, which offers fantastic views over the area and the nearby mountains, such as the scenic Mt Baula. We will continue our journey over the scenic mountain pass Hellisheiði and along Hrútafjörður fjord to the quaint village of Hólmavík, where you can explore the fascinating Museum of Icelandic Sorcery and Witchcraft. You will then drive through beautiful fjords with stunning views as the group makes its way to Ísafjörður, a typical Icelandic fishing town hidden in a deep, majestic fjord, where you will spend the night in comfortable accommodation. Today you will explore the Westfjords, the oldest part of Iceland, which was carved out during the Ice Age. The region is characterised by high mountainous fjords, rugged terrain, uninhabited valleys, rich birdlife, seals on the beaches and challenging road conditions. As you wind through the scenic roads, keep your eyes peeled out of the window and take in the marvellous sights on every horizon. The highlight of the day will undoubtedly be the sublime 100-metre high Dynjandi waterfall, which looks like a bridal dress. You will have time to walk up to this majestic waterfall and admire this beautiful natural work of art. 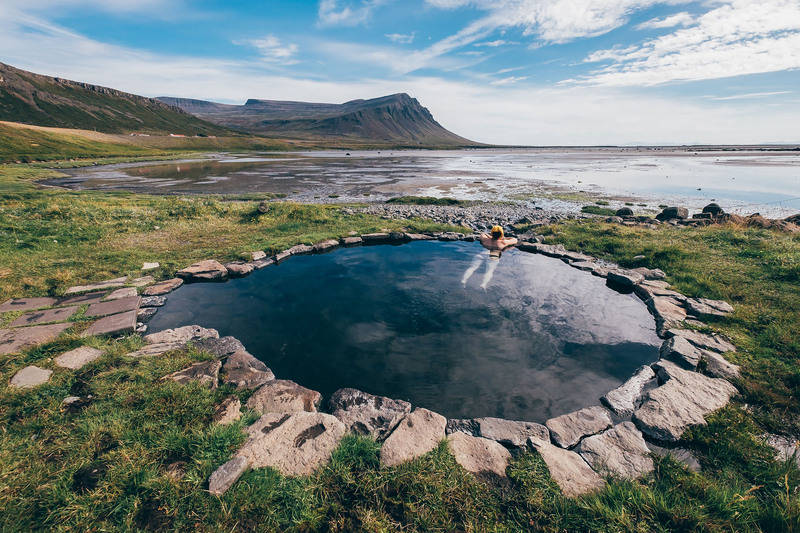 As you continue south, you will enjoy fantastic views of mountains and fjords, and you will have the chance to bathe in Reykjafjarðarlaug, a terrific natural hot pool right by the ocean. You will visit the small Bíldudalur village and spend the night in Patreksfjörður, a small fishing village full of charm. You'll start the day by travelling over the Hafnarfjall mountain pass on to Látrabjarg. This is the westernmost point of Iceland (and Europe! ), with impressive cliffs up to 100 meters high, have a very rich birdlife. There are usually a lot of puffins nesting in the cliffs and it's possible to catch them posing with your camera, promising some excellent photos. 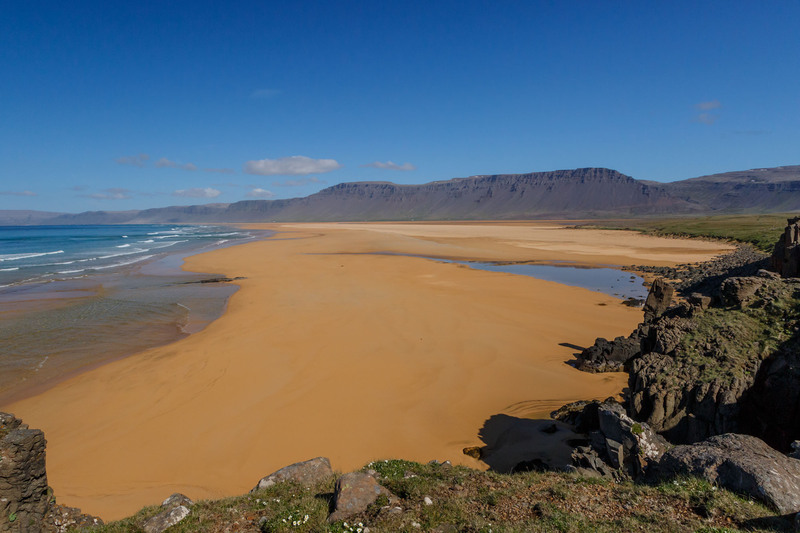 From Látrabjarg, you will continue onto Rauðasandur, the 'Red Sand Beach', a romantic beach in a spectacular setting. As most coastlines in Iceland are made up of black sand, this beach is an exception in Iceland and on clear days, it's tricky to see where the sea and sky begin and end. As you continue your journey, you will have more chances to take a bath in some natural hot springs along the coast. From Brjánslækur, you will cross the fjord on a ferry called Baldur. The ferry ride offers a view of the numerous islands on the Breiðafjörður bay, including Flatey, the biggest of the islands, a place where time seems to stand still. You will spend the night in Stykkishólmur, a charming village with colourful old houses, a picturesque harbour and scenic views over the bay. The Snæfellsnes peninsula is famous for its majestic glacier volcano Snæfellsjökull. This mystical glacier volcano featured as the entrance to the centre of the Earth in Jules Verne’s novel 'Journey to the Centre of the Earth'. Before reaching the glacier, you will visit the magnificent Kirkjufell, one of Iceland’s most iconic mountains and star of Game of Thrones, "the mountain shaped like an arrowhead". The Snæfellsnes peninsula offers a great variety of landscapes: unique lava formations, breathtaking cliffs, rich birdlife, black sand beaches, volcano craters and more, which is why it is often referred to as Iceland in a nutshell. You will visit Djúpalónssandur beach, the villages Arnarstapi and Búðir for another unforgettable day of adventure discovering the beauty of Iceland, before heading back to Reykjavík.